In our previous blogs we have explored different paradigms of working; the subjects of the gig economy, the digital office and flexible hours are on the rise and reflect our modern ways of working. 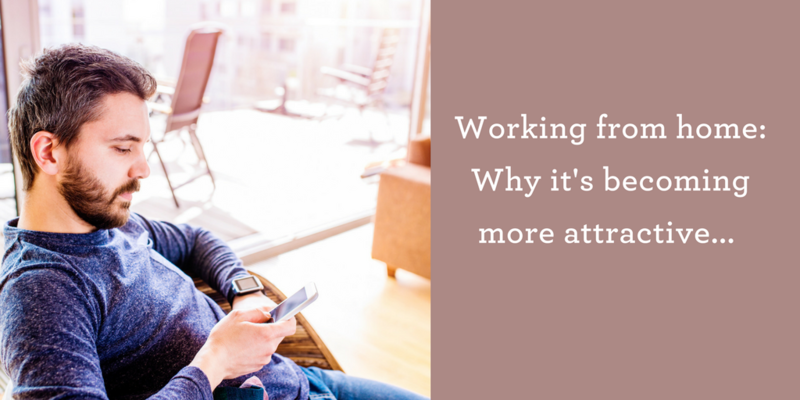 In this blog we look further into the topic of working from home. Many candidates ask us if this is an option offered by employers when they are considering a new role. They often view prospective employees more favourably if they offer this option, in fact, it may be a draw when it comes to choosing a company. Candidates may look to work entirely from home, or want to combine commuting into the main office with days in their home office. An increasing number of our clients do more than pay lip service to work-life balance issues; working from home is becoming a more usual option. In Jersey, sometimes the lack of suitable office space and the cost of commercial rent makes the virtual office more attractive, especially for tech companies or small start-ups. An employer with a substantial number of home workers may be able to rent a smaller office space and help save employee’s travel and parking costs. Costs may be lower for both employee and employer making it a win-win situation. Plus, employees are keen to offer the option as part of their culture. We see a lot of company’s with a more holistic approach to employing, with flexible hours, working from home and other benefits such as dress down days and in office massage therapy. Understandably, employers may have concerns about the viability of home working, so too can employees, who often fear being sidelined or in some way disadvantaged if they are not in the office. However, there are many social benefits from working in an office, this is not to say that employees do not value the chance to work from home. Having more time to take the children to school, walk a dog, or catch up on housework is appealing to many in our busy society. Making a success of home working is a goal that both employer and employee can share. There are several practical points to consider. The employment contract must be appropriately amended to reflect the new working arrangements. It is also prudent to include a clause allowing the employer to require the employee to attend the office when necessary. The contract should also address working hours. This is often a prime concern for employers, who may be fearful that their employee will be hanging out the washing or taking a long lunch rather than working. It is perfectly acceptable to require a home worker to be available for normal office hours, if this is what the employer wants. Providing a mechanism by which an employee can account for their time, such as time sheets, can also offer reassurance to the employer. No home worker may be treated less favourably due to his or her place of work. This means the employer must ensure they still have access to any on-site facilities, such as a gym, and are invited to team lunches and outings. Confidentiality and data protection can be a concern. To some extent, this can be addressed by ensuring the employer provides the employee with their work computer equipment; however, this does not negate the need to consider who else might have access to the computer or confidential documents. Also remember that health and safety legislation extends to home workers; most importantly, this means that the duty to conduct risk assessments of their working environment still applies. The employer must check that their public liability insurance covers home workers; equally, the employee must ensure they have their mortgage provider’s consent to work from home. Provided these points are satisfactorily addressed, there is every reason to assume that a proposed change to home working will succeed. A final note of reassurance for the employer is the opportunity to put the altered working conditions on trial for a set time. If this is included in the contract, the employer will be able to require the employee to return to office-based working. If you have any questions on this subject or would like an informal chat, please don’t hesitate to contact us.